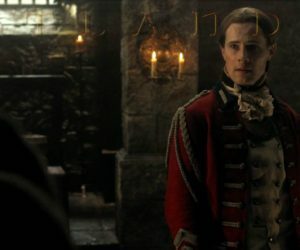 In this episode, we chat preparing for the role of Lord John Grey, the letters he wrote to other cast mates, his take on Diana Gabaldon’s writing, and his favorite characteristics of Lord John Grey. Episode 119 of Outlander Cast is brought to you by SHUDDER. Angela Hickey for arranging and performing this interview. For the past four years I have attended the Novel Adventures “Gathering on the Ridge” with Kim and her “Jamie”, Brian. This year’s meet up with David Berry (and his friend, Matt Copley) will be difficult to top. David is every bit as honorable, funny, compassionate and talented as the man he portrays. LJG is in great hands. I spent four days with the man and he is as genuine as they come. I’m so happy Angela got to interview him for Outlander Cast. The song he and Matt sang was a thank you to Kim and Brian for the wonderful time he (and Matt) experienced at “Fraser’s Ridge” in the beautiful Blue Ridge Mountains of NC. And knowing that this was K&B’s wedding song, David invited them to slow dance while he sang. There were many happy tears shed watching this outpouring of love. The piper you heard is with Seven Nations…an awesome band. Those of us who love David as LJG are hoping a LJG spin off will occur. A grassroots effort of using the hashtag #IWANTMYLJG to get the attention of the powers to be to make this happen was born from this Gathering. I hope you can one day experience this magical meet up with Novel Adventures held during the Grandfather Mountain Highland Games. Thank you !! We hope to be there sometime soon. 1. Yes, the bagpiper was a member of the Seven Nations Celtic rock band, and what you heard was a part of the accoustical concert that they performed just for our event. They are an incredible band, known worldwide, and if you have never heard them play, you should check them out! 2. I positively melted when David and Matt dedicated that song to my hunny and me. Literally, I was a mad mess, crying into his shoulder as we danced in front of everyone. It was probably in the top 5 most memorable moments of my life. ? Kim – thanks so much for giving us the opportunity to catch such great audio! Thank you Kim for the opportunity to bring this content to our group. It gave everyone a wee droughtlander treat! I loved your event.. I will be back! I also have been petitioning for a LJG spinoff, so I am with you! David Berry, if you see this, interviewing you was a true pleasure (as well as seeing you again at Creation NJ) . Thank you for you grace and generosity. Looking forward to all you will bring to S4! Here is a question for you. 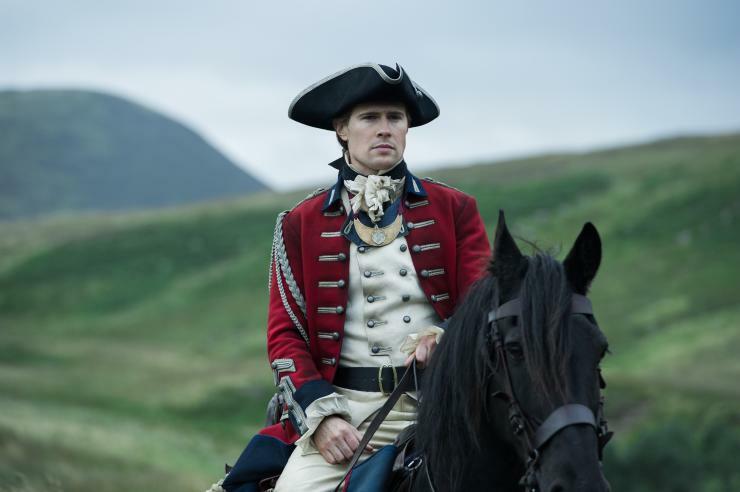 Assuming that there will be more seasons, do you think that Lord John Grey and Willie are going to be participants in the Revolutionary War? Now I know that you’re saying “But Willie is just a kid.” But let’s not forget that where we left off in in the series it was only 1767. So there is a decade to go before the war officially starts. And William was born in 1758. I’m sure that you can do the math. So now answer this question, Blake. If only for yourself. Which side of the Revolutionary war will Lord John and William be on? Will it be on the side of the rebels or the redcoats? And will Jamie and John be trying to persuade each other to join the other side? Jamie has Claire who can tell him that the Americans are going to win the war. John has already seen the Scottish rebellion fail. He’s going to assume that America will lose and won’t want to see Jamie setting himself up for another massacre. Jamie on the other hand would prefer that John be on the side of the rebels, but he can’t tell John what he knows or how he knows it. And here’s the major question. Can their friendship survive the war, if they choose opposite sides? This war severed a lot of friendships and family ties. So can their friendship stay intact, given their politics? hmmmm…this is a great question. And I suppose the answer would be dependent upon LJG’s reasoning for being in the colonies in the first place. I wonder if he is there because his wife kicks him out, then I can see him probably giving up on the formalities of everything and siding with Jamie. BUT – if he is there on his own volition, or his wife died – I definitely see him holding onto the propriety of being an english gentlemen/solider. That being said – can their friendship survive? I believe it will. Sometimes politics is politics and business is just business. Especially when you consider the fabric that holds them together – Jamie’s son. He was perfect for this role. I didn’t get to see him in Las Vegas…Hopefully at my next convention.